Holocaust memorial under construction alongside the Houses of Parliament. So far, so crowd-pleasing. But Britain’s relationship to Israel, and to her own history in the Middle East, is rarely that comfortable. 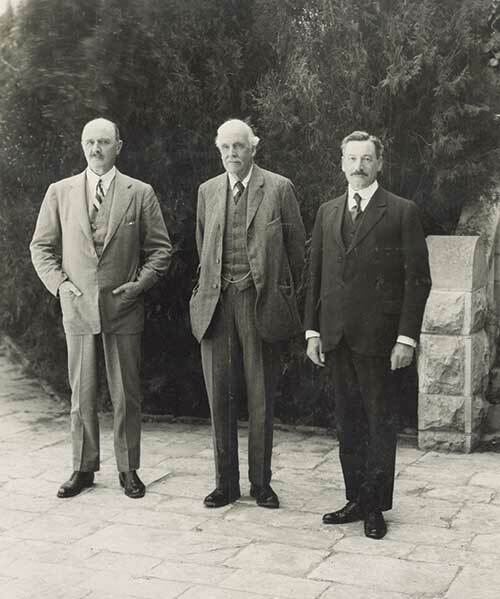 Despite rejecting the Palestinian Authority’s demand for Britain to apologize for the Balfour Declaration, May was at pains to emphasize that there was still “unfinished business,” since Balfour’s “fundamental vision of peaceful co-existence has not yet been fulfilled.” As has become customary in any British government statement relating to Israel, the prime minister reiterated her dedication to a two-state solution and her opposition to the construction of settlements beyond the Green Line. In his statement on the Balfour centenary to the House of Commons, Foreign Secretary Boris Johnson also spoke of “unfinished business.” Evidently, the official line was to celebrate the declaration, but not without qualification. If Anglo-Zionist relations have not always been easy, they could soon be much worse. The elephant in the room—or rather outside it—was Jeremy Corbyn, leader of the Labour Party, who refused to attend the dinner. A patron of the Palestine Solidarity Campaign who has previously referred to his “friends in Hamas and Hezbollah,” Corbyn is the kind of radical leftist until recently considered anathema to mainstream British politics. But these are unusual times. If his election as leader of the Labour Party in late 2015 surprised pundits, his narrow loss in the 2017 snap elections—during which a 25-point Conservative lead in the polls largely eroded over the space of seven weeks—provoked widespread disbelief in the country at large and disquiet in the Jewish community. Corbyn’s excuse for not attending the Balfour celebration was that he “doesn’t do dinners.” Yet, in the same week, he found time to attend an evening reception in the House of Commons hosted by Muslim Engagement and Development (MEND), a charity with Islamist connections dubious enough for most other members of Parliament to give the event a wide berth. 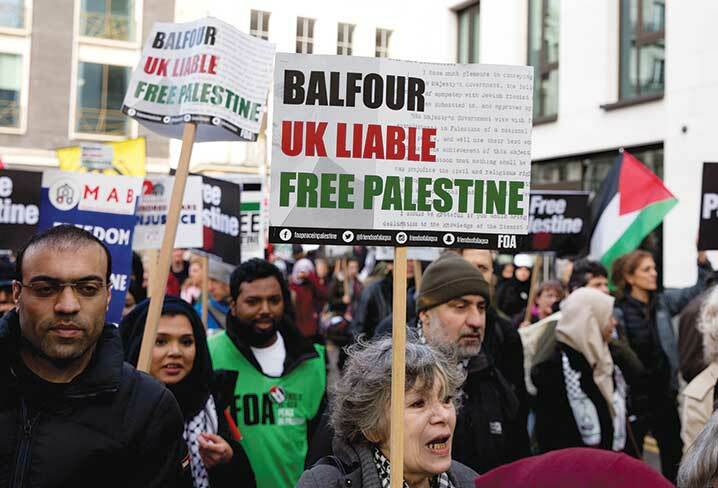 Labour was represented at the Balfour centenary by its shadow foreign secretary, Emily Thornberry, but she was clear that her attendance should not be understood to imply endorsement. Asked about the centenary in a recent interview, Thornberry replied, “I don’t think we celebrate the Balfour Declaration,” adding that “the most important way of marking it is to recognize Palestine.” Had Labour won in June, there may have been no official celebration. The recent controversy over the celebration of the Balfour Declaration’s 100th anniversary is a microcosm of Israel’s place in British politics. Indeed, the centenary has fallen at a potential inflection point in Anglo-Israel relations. By British standards, the governments led by Prime Ministers Cameron and May over the past seven years have been particularly sympathetic to Israel. Quickly abandoning the critical-friend posture he had adopted at the start of his premiership (notoriously, he described Gaza as a “prison camp” during a visit to Turkey in 2010), Cameron emerged as a vocal ally of Israel. During both Operation Pillar of Defense in 2012 and Operation Protective Edge in 2014, Cameron stood firm in his support of Israel’s right to self-defense against rocket attacks from Gaza, defying not merely a well-organized pro-Palestinian lobbying campaign but also Liberal Democrat members of his coalition government. But this high-water mark of official British support for Israel still falls short of mainstream positions in American politics. President Obama’s refusal to veto Security Council Resolution 2334, which condemned Israeli settlements including those in East Jerusalem, was widely perceived as a vindication of Palestinian attempts to internationalize the conflict, and a nadir in U.S.-Israel relations. Yet Britain voted for it. While some reports have attributed Britain’s support for the resolution to a mistake by a junior minister, it was in fact consistent with government policy. The fear of appearing too close to Israel affects more than British policy on settlements. Less than a week after the Balfour centenary, a diplomatic scandal involving senior Israeli officials precipitated the resignation of Secretary of State for International Development Priti Patel. One of the most outspoken supporters of Israel in the Cabinet, Patel had apparently been meeting Israeli ministers, including Netanyahu, behind the foreign secretary’s back, while formally on vacation. Somewhat farcically, she was flown back from a mission to Africa to be dismissed. But the official version of events was soon called into question. The Jewish Chronicle, citing sources in Downing Street, reported that Patel’s unofficial diplomacy in Israel took place with the consent of the prime minister, who had asked her not to disclose the meetings. The truth of the matter remains unclear. But would a breach of diplomatic protocol involving another country have provoked the same response? Priti Patel’s exit from the Cabinet reflects the wider weakness of the current government. Shell-shocked by a failed election gamble which cost her party its majority in Parliament, Theresa May has struggled to regain her authority and to resolve internal disagreements over Brexit in the Cabinet. Were the government to fall, and another election to ensue, the polls point to a Labour victory. A win for Corbyn, the most left-wing Labour leader in more than 30 years, would radically reverse Britain’s approach to the Middle East. Yet Labour has not changed its spots overnight. Since Tony Blair’s resignation in 2007—in part precipitated by his defense of Israel’s 2006 campaign in Lebanon—the party has continually moved to the left in both domestic and foreign policy. Ashamed of the last Labour government’s backing for the Iraq War, Corbyn’s predecessor, Ed Miliband, effectively vetoed any British military intervention against Bashar al-Assad. The party’s policy on Israel was by no means exempt from this leftward shift. In contrast to Cameron, Miliband condemned the IDF during Operation Protective Edge. Two months later, he whipped Labour MPs to back a nonbinding parliamentary motion on the unilateral recognition of Palestine. Whether or not Corbyn makes it to 10 Downing Street, its next Labour occupant is likely to be far less friendly toward Israel than any prime minister since Ted Heath in the early 1970s. But when the Jew has a national home, surely it follows that the impetus to deprive us of the rights of British citizenship must be enormously increased. Palestine will become the world’s Ghetto. Why should the Russian give the Jew equal rights? His national home is Palestine. The importance of Israel to British Jews helps explain the dramatic recent shift in their political allegiances. Just prior to the 2010 election, a survey of Jewish voters suggested an even split between Conservative and Labour, with each party claiming 30 percent. By 2015, with Miliband leading Labour, similar research found that 67 percent of Jews intended to vote for the Conservatives, compared to just 14 percent for Labour. In 2017, faced with the prospect of Corbyn becoming prime minister, that gap had widened to 77 percent for the Conservatives and 13 percent for Labour—such that, in an election where the Conservatives lost seats in the capital, constituencies with high Jewish populations in north-west London conspicuously stood out as blue islands in a sea of red. Jewish nervousness about a Corbyn premiership relates not just to his record on Israel, but also to his apparent indifference to anti-Semitism within his party. Offenders have been merely suspended from the party, rather than expelled. These include the former mayor of London Ken Livingstone, who has repeatedly insisted that there was “real collaboration” between Zionists and Nazi Germany prior to World War II, and Jackie Walker, former vice-chair of the pro-Corbyn campaign group Momentum, who, in a discussion of the Holocaust on her Facebook page, wrote that Jews were among “the chief financiers of the sugar and slave trade.” An internal inquiry into anti-Semitism, which found no evidence of it, was widely dismissed as a whitewash. Corbyn subsequently rewarded its author, Shami Chakrabarti, with a seat in the House of Lords and a position in the Shadow Cabinet. Given Corbyn’s prior record as an apologist for anti-Semitic conspiracy theorists and terror sympathizers, expectations of leadership from him on this issue were low. He has not exceeded them. If Jews are becoming personae non gratae within Corbyn’s Labour party, the question arises as to what kind of climate he would foster as prime minister. As yet, there has been no widespread Jewish emigration from Britain to Israel, as there has been from France—in part, because British Jews have not been targeted by thugs and terrorists in the same way as their French counterparts have. But might a Corbyn government precipitate a comparable exodus? Thankfully, Edwin Montagu’s fears about the status of Anglo-Jewry in the wake of the Balfour Declaration have proven largely unfounded over the last 100 years. Nonetheless, it is not impossible that British Jews may come to thank Arthur Balfour for providing them with an escape route. Simon Gordon is currently a graduate student in political economy at King’s College London. Previously, he served as a speechwriter to Douglas Carswell MP and to Israel’s former ambassador to the United Kingdom Daniel Taub. whom Balfour’s agenda completely discarded. should listen to bells that for them long are tolling. for Israel to happen. Don’t be disenchanted. who lack God-given titles to their soil. promising good fortune to the land. into Dreyfuses whom they accuse. this connection postulated between them is one that should not be endorsed..
when, celebrating Balfour's Declaration, they about the so-called settlements complained. and would be more disastrous than the one from Gaza that would give birth to Hamas. refusing territorial divestment that's demanded by a Boycott bus. Robert Eisen was walking to campus on 9/11 when he saw a dark cloud above the Pentagon. Alick Isaacs fought for the IDF in Lebanon. Their experiences prompted them to rethink peace and Judaism. How the Jews became modern.